There has been a long time since the first RDTA appeared. 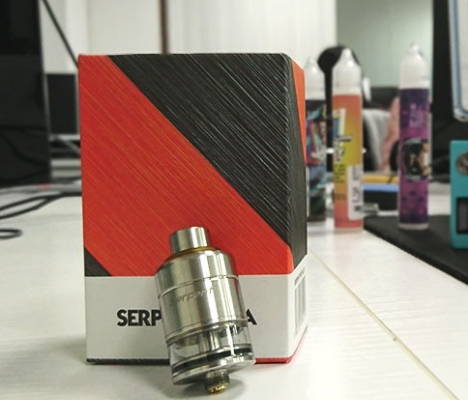 But RDTA, with very deep flavors of RDA and endurance of RTA, has failed to become popular all the time due to some fatal defects in design, which bring unpleasant experience to some vapers. 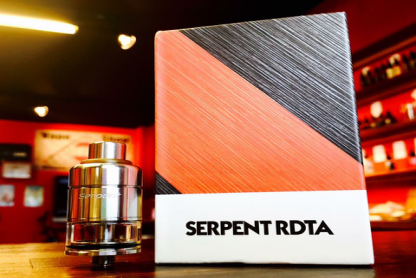 So this time can we get some improvement from wotofo serpent RDTA? Still with the wotofo style, but there are some changes on the back of package with detailed information of goods’ quantity and warnings, including 1*Serpent RDTA, 1*Supplementary Pyrex Tank, 1*Drip-tip supplementaire, 1* Screwdriver, 1*Japonese Cotton Pad, 2*Twisted Coils, 1*Set Silicone Joints. The stainless steel Atomizers (22mm diameter) with mellow shape, looks smaller and delicate. 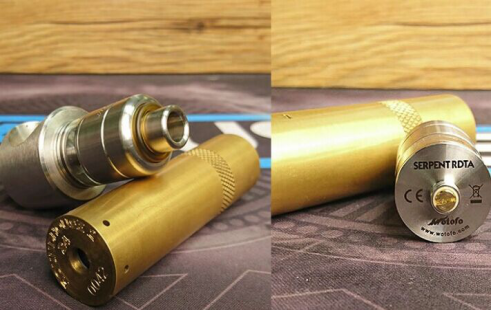 The yellow PEL material and the 510 Drip Tip makes the metal color look smoother. The design of Drip Tip is similar with the Atomizers tank for the nice appearance on its rounded top, which looks more comfortable. 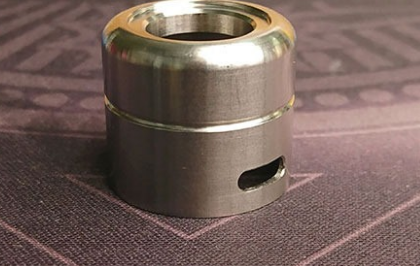 The slot in middle of Atomizers tank joints well with other parts , and we can see the manufacturer has made great efforts in its appearance. 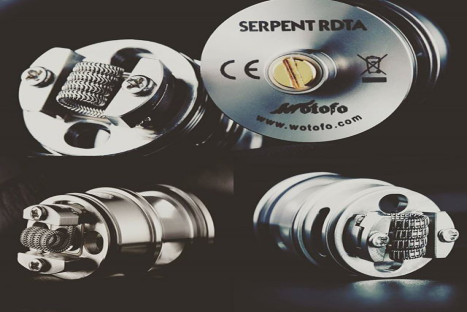 The wotofo serpent RDTA can be divided into 510 Drip Tip, Atomizers tank, electrode units, Glass Replacement, the deck of tank, and Electrode screw. There are two ways to dismantle it-General dismantling and complete dismantling. Generally, only dismantle the lid and the deck ( not the tank), filling cotton into the tank from the deck. Complete dismantling is needed when players want to clean and replace E juice. That means players have to dismantle the Electrode screw at the bottom or the tank cannot be unscrewed. 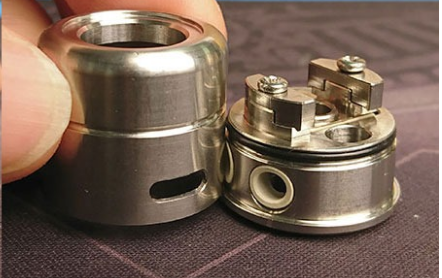 A conical part(6.5mm~7.5mm diameter inside) into the stainless steel drip tip can make the condensate reflow. 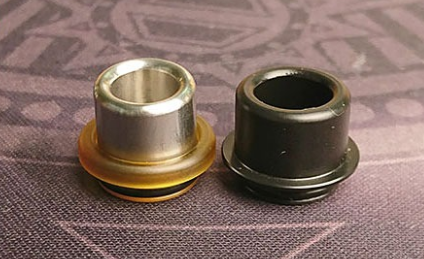 The drip tip (8.5mm diameter inside) made of Heat insulation material, without a conical part, enlarges the size of vent. Apparently, it serves for thick smog chasers. The atomizer tank inside was made into an arc shape, which can compress the vapor further. It is great in work without any defects visually. Inside the tank, only 9mm in height. Except the electrode column and the wick, the space inside the tank is very small. Such a design is common in taste RDA, and it can concentrate smog greatly to help vapers to get better flavor. A pressing electrode column is used in the deck, and the wire can be installed and operated easily. But there is no spring inside, so it is a little bit inconvenient for vapers and they have to more it by themselves. In the middle deck, the size of vent hole is 4mm large. From the arrow in the picture, there are four vent holes but actually four inside. It can help take heat and smog away effectively from the wire. 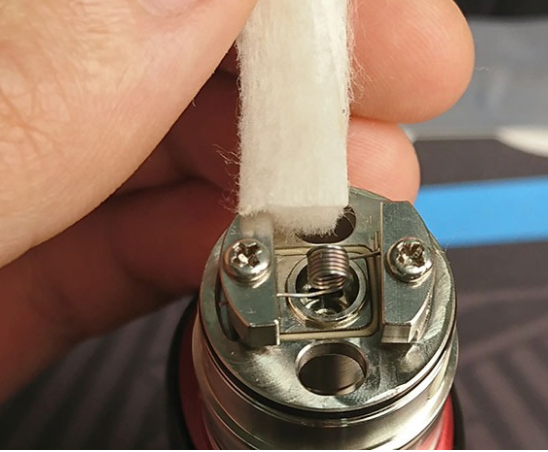 The cotton hole is on both sides of the vent hole, also with 4mm large in size, to ensure the circulation of E juice. 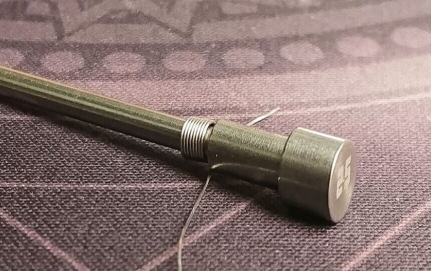 The electrode screw needs to be removed when vapers want to dismantle the tank. During this process, vapers don’t need to worry about the waste of E juice because the tank can contain 2.5ml E juice at most. By the way, medium users can play RDTA for 3 to 4 hours due to its lower endurance. All the wires tested this time are from efun.top. Data: 28ga, 2.5 diameters, 8 rounds closely. 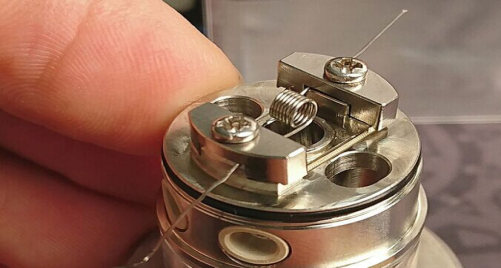 Use single coil wire and make it right above the air hole. Use thinner wire to place the cords on top. To fix the wire better and don’t need to do anything with the cords. Use right width of cotton, like makeup cotton from MUJI and GANGWON. I use the cotton cut into 2.5 diameters in width, and remove the non-woven on both sides to thread the cotton. Use tweezers to fill the cotton in. The length of cotton is 2.5cm. 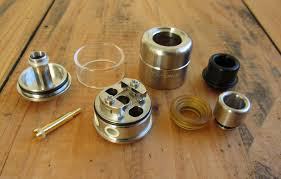 It is very easy to operate without dropping E juice into it again and clean it. 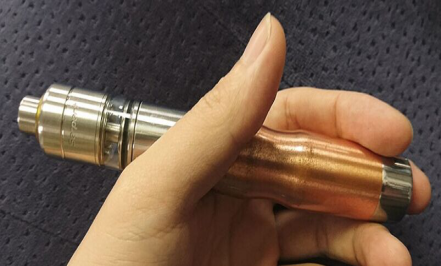 When using single coil tank, vapers can use it safely and wicks can be changed quickly. 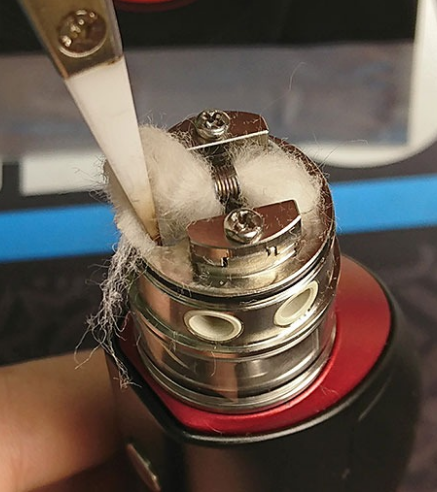 Players don’t need to put the whole part of cotton into the tank because the atomizer will be leaned when smoking and the E juice will inflow it. After several tests, finally I’m sure that wotofo uses the same coil tank as the taste RDA. 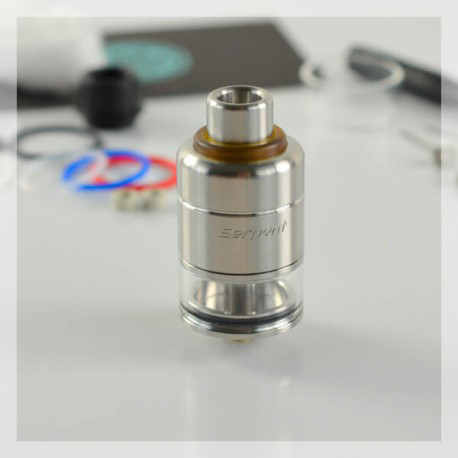 Some popular types of coil tank like Big smog or other else don’t fit this atomizer because it will cause heat smog and then essence will be destroyed. 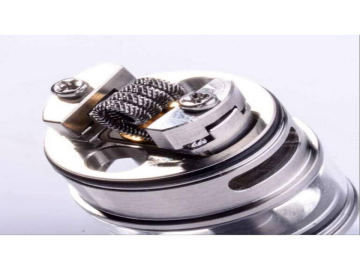 ①wire diameter 0.2, circle diameter 2.5, number of turns 9, single coil tank, power 12W, resistance 3.16Ω, 0.5mm left when air hole is on. Smoke with mouth; flavor：clear layer of taste, rich flavor, full-bodied taste, high taste reduction. ②wire diameter 0.3, circle diameter 2.5，number of turns 8, single coil tank, power 18W, resistance 1.52Ω; air hole is completely on; smoke with lugs. Flavor of smog: the detail is slightly inferior to ①, the clearness is still in higher level but lower than KF3; still good in fullness; more full-bodied than ①; similar to ① in taste reduction; can barely reach the level of big smog. 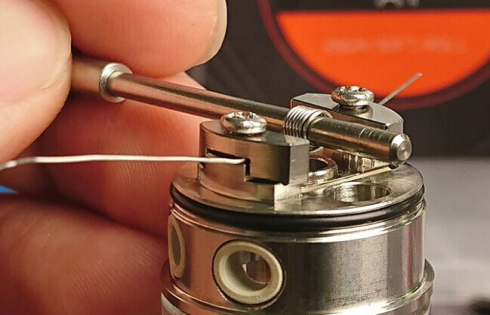 ③26ga*32ga Clapton A1 wire, circle diameter 3.0, number of turns 6, single coil tank, power 26W, resistance 0.93Ω. Smoke with lugs; bigger smog, a bit light in taste, great fullness, the taste reduction is fine, but inferior to ① and ② in the layer of taste. ④Original 3.5 lap diameter Clapton wide wire, single coil tank, 0.6Ω, the flavor is quite intense, the taste reduction is fine, strong sense of particle, big different from other 3 ways in layer of taste. To be honest, I almost underestimated Wotofo when I got it because you know people will use complex coil and low resistence coil to make big smog. I made a mistake on using complex coil constantly to have tests, so the results are not good. But when I use 0.4 3.0 7 laps coil, the results are better. I am very impressed that Wotofo is purely a palate RDTA. I have to say RDTA has the advatage in leading E juice and it allow 5V to use it. Players don’t need to worry about over- burning wick and they can enjoy their vape safely. . I know lots of new players touch vape of KF series firstly. But many of them give up flavor RDTA after they try RDA for its rich intense flavor and big smog. 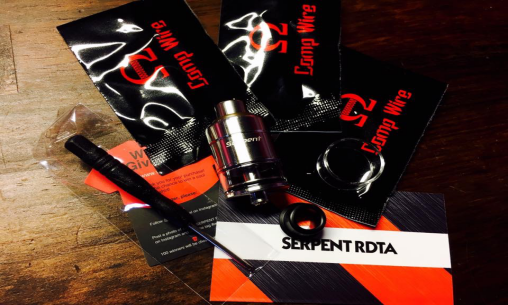 I believe this serpent RDTA will bring you the feelings you want like before. And it worth trying for those like delicate taste. я с али что-то опасаюсь баки покупать, бывает клоны присылают. Конечно потом деньги вернуть можно, но все равно время потратишь. Так тут в шапке темы такая же цена как на али. не знаю может еще форумный код купона сработает! По ссылке, что я дал цена меньше на 6.23 доллара и ещё 10% кэшбек и доставка опять же быстрая.